The main aim of Alumni Social is to bring the business community and NGOs closer together. We want to build bridges between them. We offer life-changing experiences. 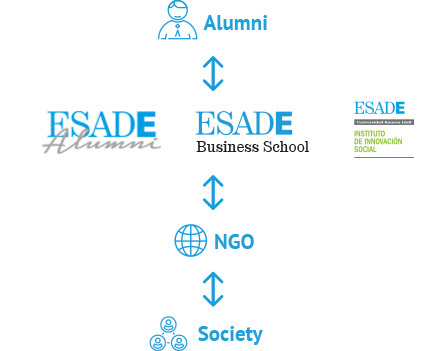 Many ESADE graduates hold management posts, and their business decisions and actions can contribute to a fairer, more sustainable world. We want the third sector and the business community to collaborate with each other. This means that they must learn about the other’s world and accept each other. This is how Alumni Social works: former students (from the business community) become volunteers, get involved in the third sector and contribute their knowledge. At the same time, this contact with non-profit-making organizations makes businesses and executives (alumni) aware of the more disadvantaged segments of our society. What results will the long-term changes implemented by Alumni Social activities be? 1. Professionalisation of NGOs: improvements to society achieved by increasing their own results (by implementing consultants’ advice). 2. Executives with greater awareness and, therefore, greater social responsibility who could then, with their decision-taking, help achieve a fairer and more sustainable world (thanks to the fresh insight into the world and its problems gained from their NGO experience). 3. Greater understanding and collaboration between the two worlds: building bridges between the third sector and the business community – all with a view to achieving most just and caring world. NGOs work with and rely on entrepreneurs (requirement).